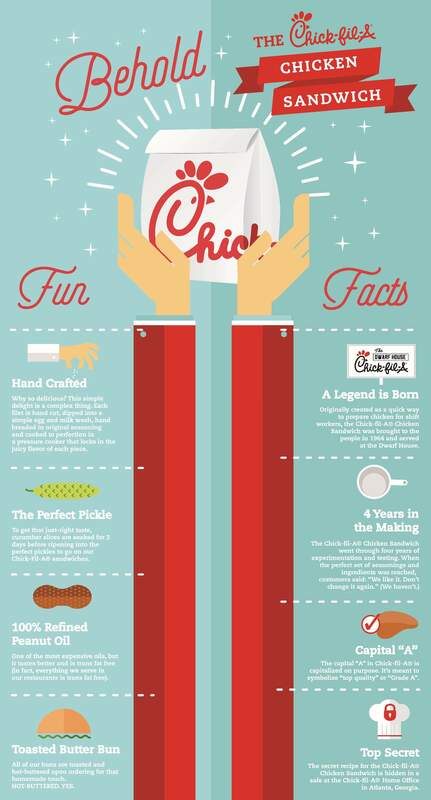 It’s Hand Crafted: Not only is the chicken sandwich made from 100 percent all-natural breast meat, with no fillers or additives, it’s also hand breaded from scratch daily inside the kitchen at each and every one of the more than 1,900 Chick-fil-A restaurants nationwide. It Took Four Years to get Just Right: The recipe and cooking method were developed by restauranteur and Chick-fil-A founder, Truett Cathy, who revolutionized the chicken sandwich. He spent four years experimenting with the recipe and perfecting the sandwich that is enjoyed by two million people daily. More than 50 years later, the recipe – which includes a blend of ingredients topped off with a toasted, buttered bun and two crucial pickle chips – still remains unchanged to this day. It all Hinges on the Pickle: To get that just-right taste, cucumber slices are soaked for three days before ripening into the perfect pickles to top the Chick-fil-A Chicken Sandwich. It’s a Capital “A” for a Reason: The capital “A” in Chick-fil-A is capitalized on purpose. It’s meant to symbolize “top quality” or “Grade A” chicken used for its menu items. It’s Pressure Cooked in Peanut Oil: The Original Chicken Sandwich, which celebrated its 50th anniversary last year, is pressure cooked in 100 percent refined peanut oil, which is naturally trans-fat free. Chick-fil-A removed all trans-fats from its menu in 2008, seven years before the FDA required restaurants to do so. Peanut oil is also naturally free of cholesterol and low in saturated fat. The unique pressure cooking technique also allows the chicken to cook faster while remaining moist and tender. It’s Top Secret: The secret recipe for the Chick-fil-A Chicken Sandwich is hidden in a safe at the Chick-fil-A Home Office in Atlanta, Georgia. It’s Always Improving: While the Original Chicken Sandwich has remained unchanged for five decades, Chick-fil-A continues to adapt to the growing needs and health preferences of its customers. By the end of 2019, Chick-fil-A will exclusively serve chicken raised without antibiotics. The company and its suppliers have collaborated to ensure that suppliers never directly administer antibiotics within their operation at any time, making Chick-fil-A’s “No Antibiotic Ever” commitment the strongest in the industry. The company also removed high fructose corn syrup from the entire menu and artificial colors from its dressings and sauces.